First Line:"I love the beginning of a hunt." Review: Toni a.k.a. McRib is a tomboy to the core. She has had the same little clique of guy friends since she was a kid. She spends her time going monster hunting and just hanging out with the guys doing guy stuff, but all that changes when one little screw up lands her in an all girls private school and she learns that there is a part of her that just might like being a girl and doing girly stuff with her new found friend Emma. One of the Guys had romance which was very clean but it had more to do with friendship and trying to hold on to something when everyone is starting to go their own separate paths. Yes there is also this little hustle that Toni comes up with, a rent-a-guy service which creates all sorts of complicated situations as well but the book was really about friendship, even the reasoning behind why she created the so called "business" was because of her desperate attempt to keep her friendships with the guys from drifting any further then it already had. I loved the humor and the drama and just the coming of age type of story that One of the Guys was, and lets not forget about Micah the boy next door who is also one of Toni's closest friends. The romance between them was sweet, I don't know how else to describe it. I loved seeing them going from just friends into something more. 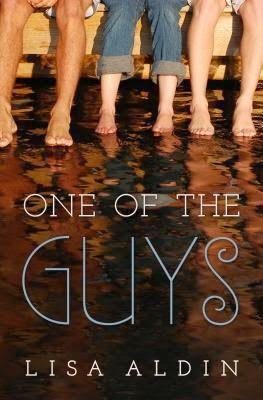 Overall One of the Guys had very well written characters whom you could easily relate to and I enjoyed reading it. This was a great debut novel by Lisa Aldin and I can't wait to read whatever else she may write in the future.